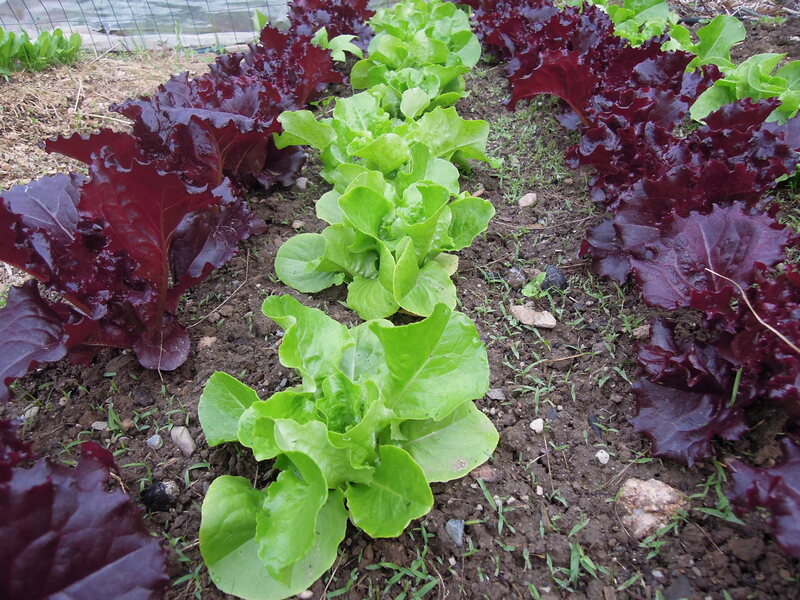 This time of year, our life is enriched with plants from both the nursery and the vegetable garden. Everyday a bounty. A great joy is to walk out in the early morning and tour the display gardens, taking notice of new growth, buds, and blossoms. The shades of green, the colorful blooms….a feast for the eyes. 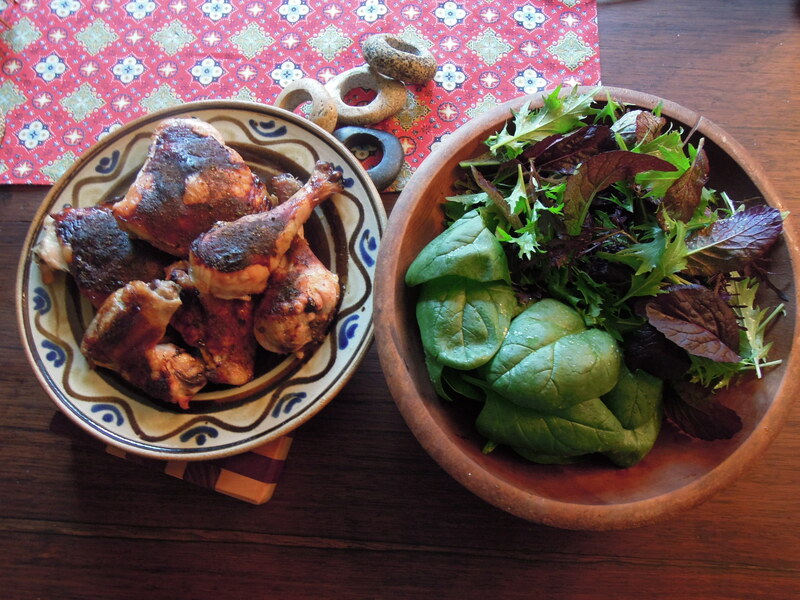 In the vegetable garden, a different feast awaits us . 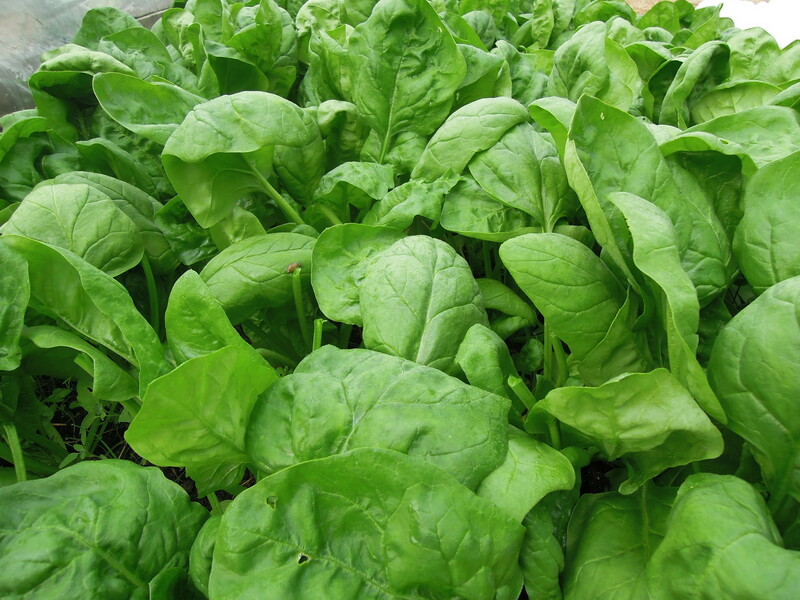 The long rows of spinach are being harvested. Some of this being eaten fresh and some being blanched and frozen for winter meals. Greens and asparagus are being brought in and eaten daily. The tatsoi and pak choi harvested, sauteed with garlic and onions, a bit of red pepper, and eaten with a bowl of brown rice. Such sustenance from both farm and nursery. At the end of the day, after tending to all the plants we grow, we consider the significance that plants have in our own lives and in the world. Encouraging others to grow a garden, whether it be strictly ornamental or a vegetable plot for growing one’s food, is a conversation and practice we are always happy to take part in. We’ve changed the date for our upcoming Hypertufa building class. What’s hypertufa? 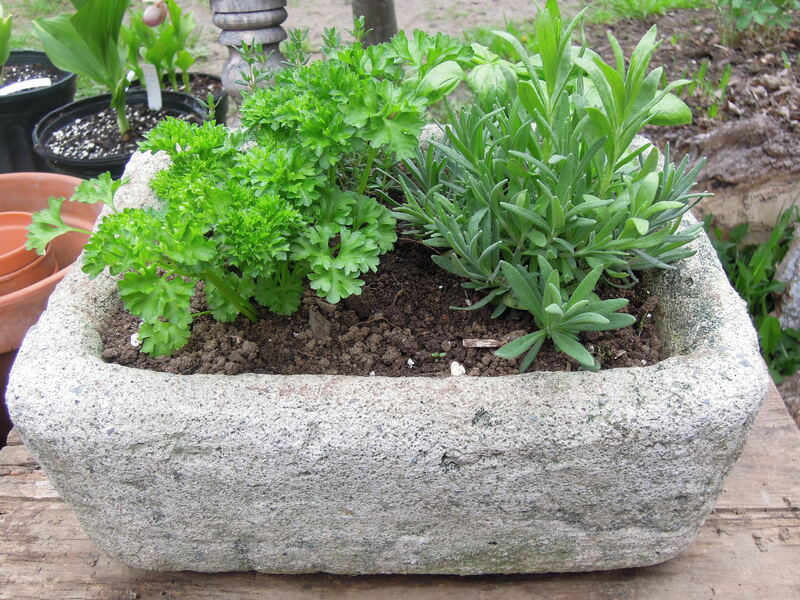 It’s a mixture of cement, peat moss, and perlite , which can then be shaped or molded into containers for planting. The result looks like a stone container but is much lighter. 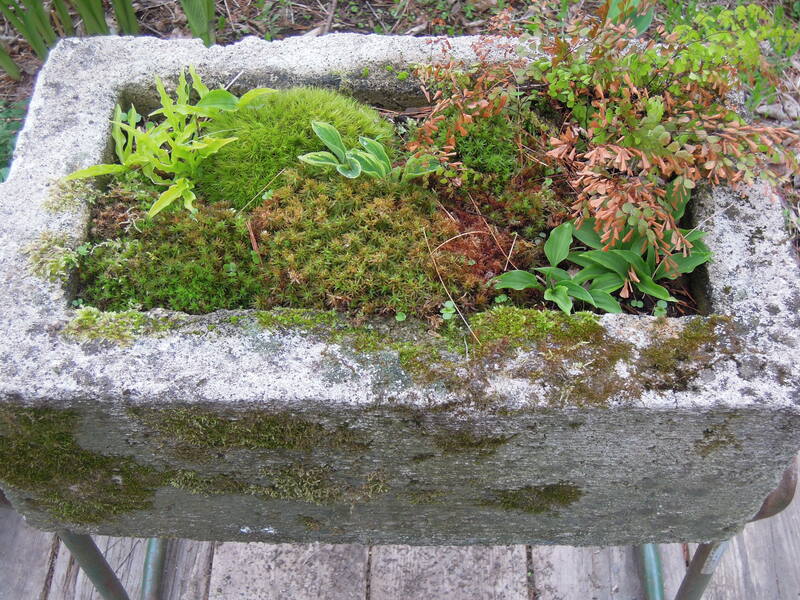 It can then be planted with a wide variety of plants…..succulents, small hostas, moss, just to name a few. 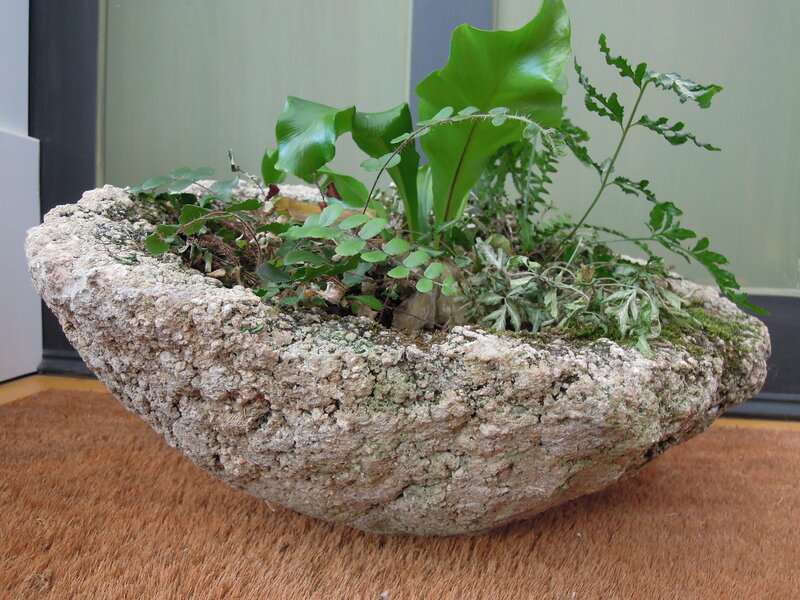 Hypertufa ages beautifully, often attracting mosses and lichens that will grow on its surface. 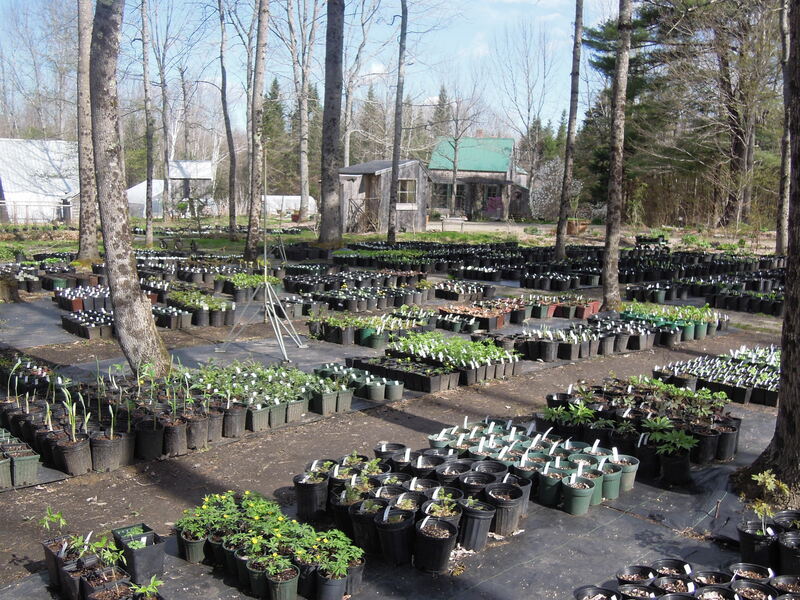 We have several here at the nursery that we’ve made and feel that they really add to the garden landscape. Rick will lead the class and participants will be able to leave with their hypertufa in hand. Class is limited to 10 people and we still have a few spots open, so let us know if you’d like to come and build your own planter! Tea and freshly baked scones will be available for class participants. Check out our page on classes for more information and details about signing up or contact us at fernwoodnursery@ fairpoint.net. This little beauty turns 21 years old today. We celebrated Zoe’s birthday last night, with more hoopla planned for today. Friends gathered for cake and well wishes. Lots of smiles and hugs. People came who have known Zoe her whole life, and others who have been witness to her more recent years of young adulthood. It was great and I cried. Twenty one, whew! Happy, Happy, Birthday, Zoe! Early this morning, we wandered around the nursery, checking out some other beauties that are also bringing joy to our days. I don’t often drive the couple of hours it takes to get to Portland. Most would say that it’s pretty difficult to root me out of our own little rural community, here in Montville. There is some truth to this. I can find all kinds of reasons to never even leave home. Home is just a nice place to be, there’s nothing wrong with that. But every once in a while, a reason to go to Portland does come up and off I go. And…it’s pretty fun. Portland, Maine is a very cool place. It’s small, as far as cities go, but big enough to find a little bit of everything. The food…awesome. Art…everywhere. Good coffee, good beer, good sushi, good energy. It’s actually kind of fun to leave the humble hills of Montville to experience the buzz of a “big community”. For sure, Portland does have community. Portland is vibrant. 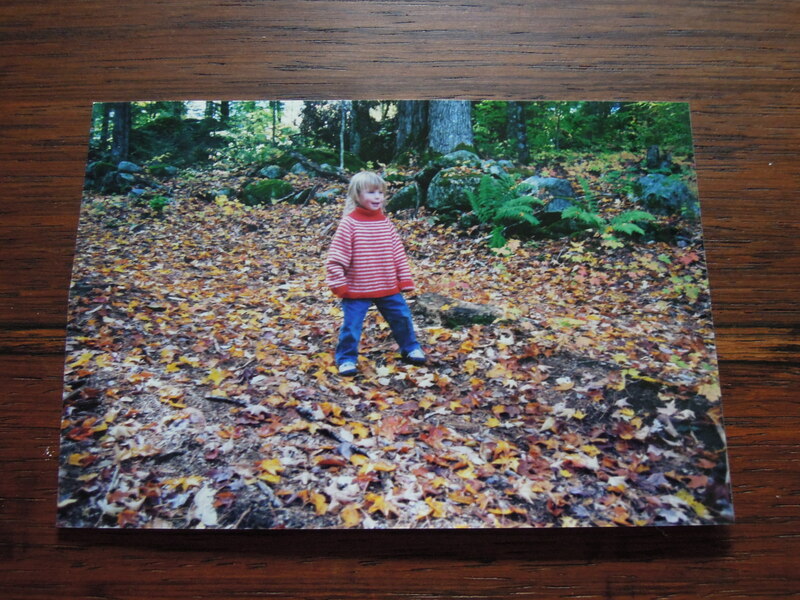 One of the best things I did in Portland , was to visit a great little garden shop on Pleasant Street, called Fiachre. 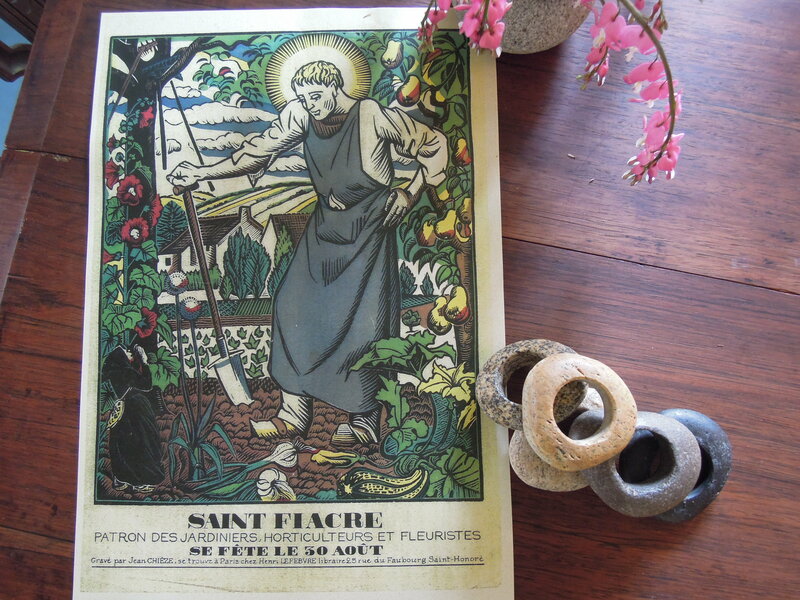 Named after the Irish St. Fiachre, patron saint of all plants and gardens. If you are in Portland…go. 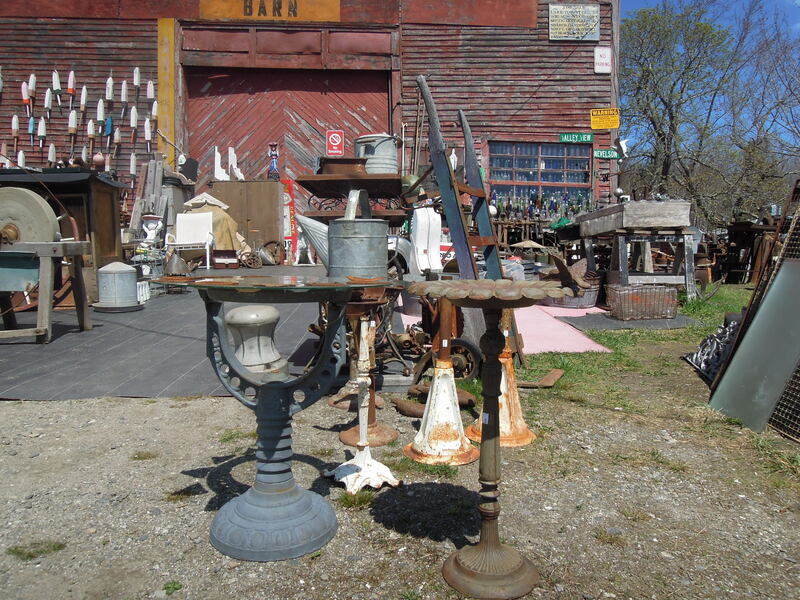 You will want to oogle everything and go home with most of it. It’s full of greeny goodness and terra cotta vessels, lovely statuary, beautifully crafted sissors for snipping spent blossoms, and glass terrariums filled with delicate little ferns and glistening moss. When I do leave home, I want to go to places like this. I just do. 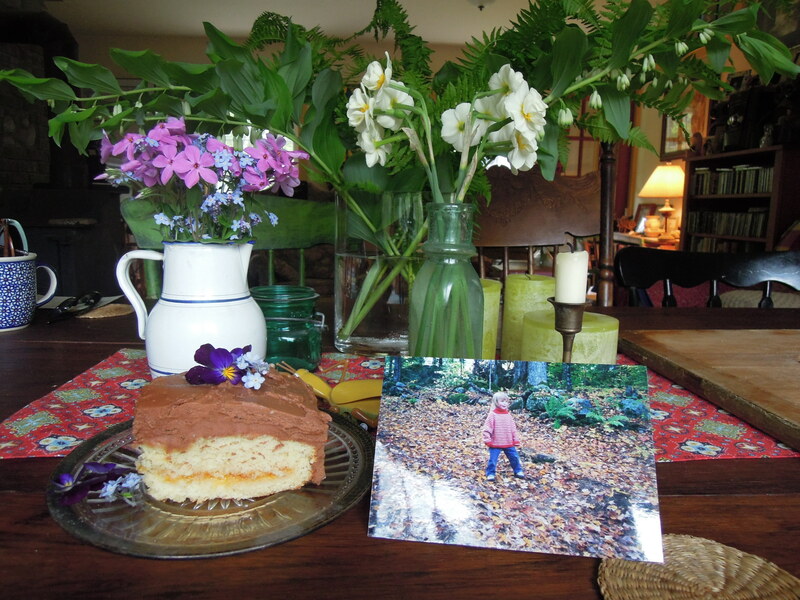 And I will…the next time a dear friend roots me up and away from our own delightful world here at Fernwood. 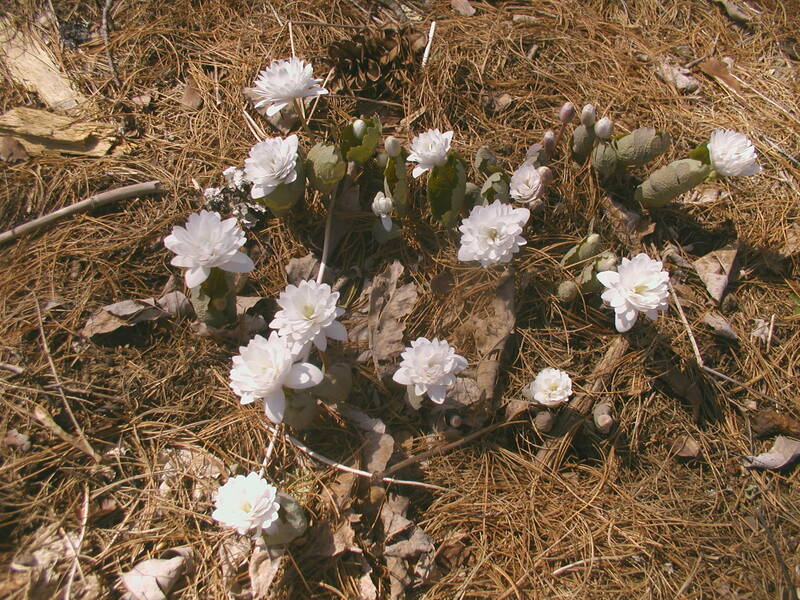 Bloodroot ( Sanginaria canadensis) is native to most of the eastern US. 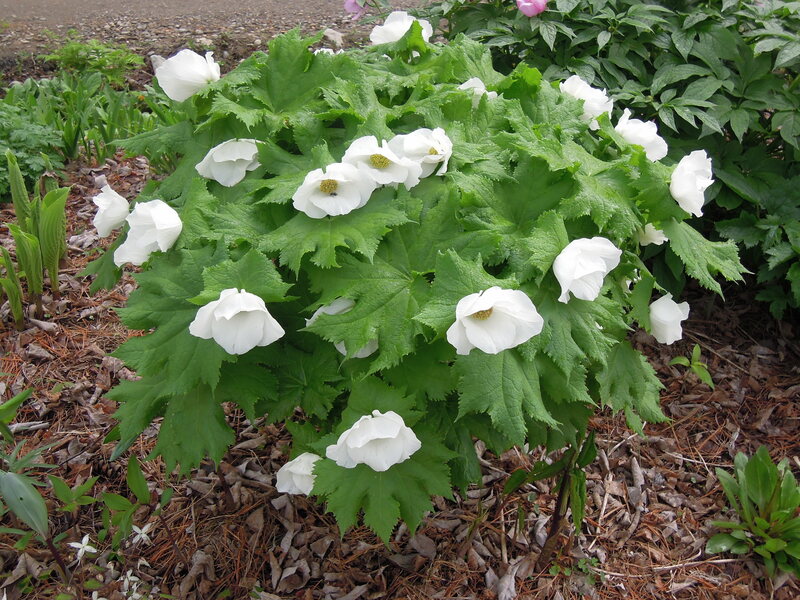 It prefers undisturbed wooded areas that are moist to dry, never wet, in part to full shade. Its ability to grow in dryer areas and compete with tree roots makes it a good choice in the landscape when dealing with maples and other trees that can take over a garden with their own roots. 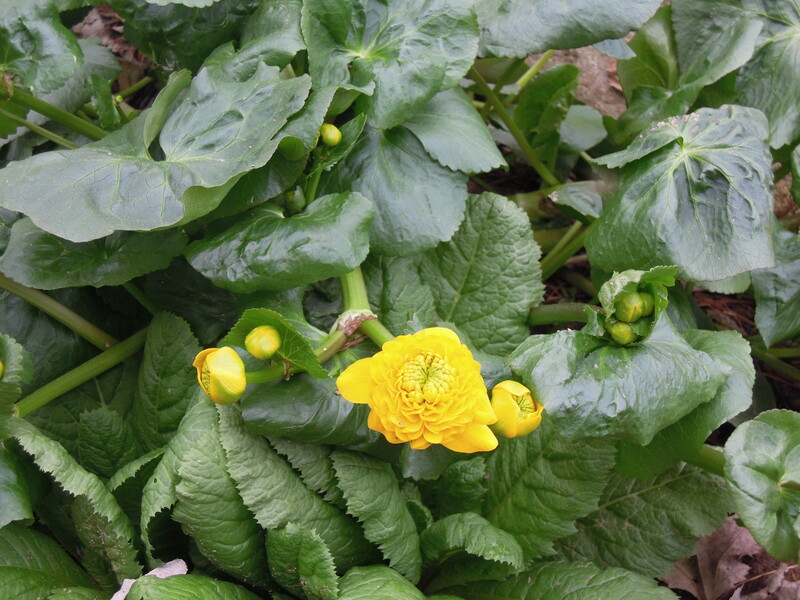 In early spring the leaves emerge clasping the flower stalk which soon opens to a white flower with a yellow center. As the flower opens, the leaves, that can be 6” across, open as well. The leaves are a light green to almost glaucous green, formed in a kidney shape that often have interesting indentions along the margin. 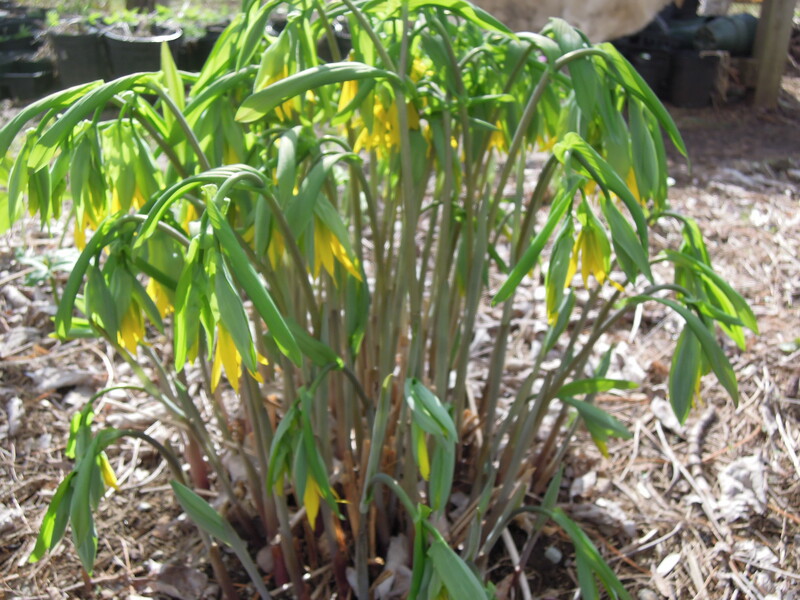 The bloom period is short, with the flowers falling off within a couple of days of being fertilized. The double form, Sanguinaria canadensis f. ‘Multiplex’ blooms much longer since it is basically sterile and does not set seed. Although bloom time is short, a patch of bloodroot in full flower is a very impressive sight. 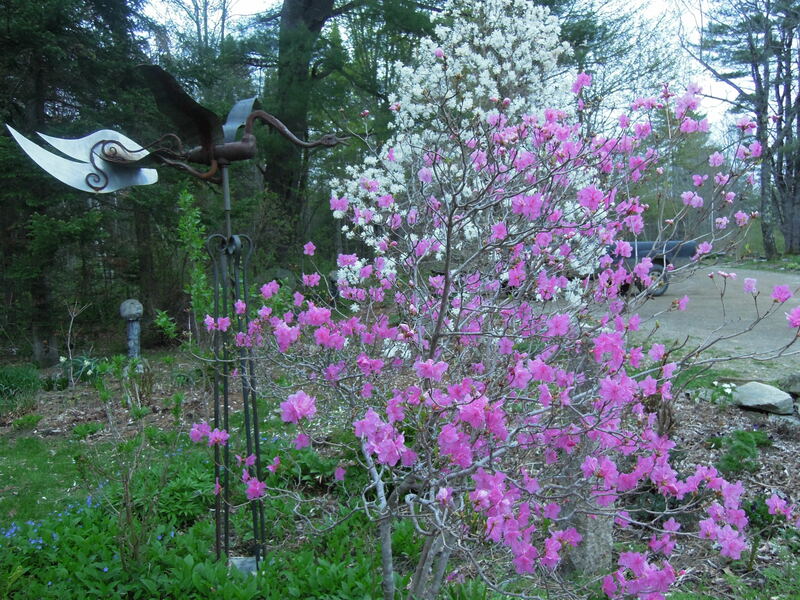 We have both forms growing here at the nursery, and it just wouldn’t be spring without them. If you plant it, you might find that it pops up in areas away from the original plants. This is due to ants that harvest the seed for the fleshy elaiosome that is attached to it. The ants can then carry the seed a considerable distance away from the original plant. The elaiosome, which they eat, is high in lipids and proteins. 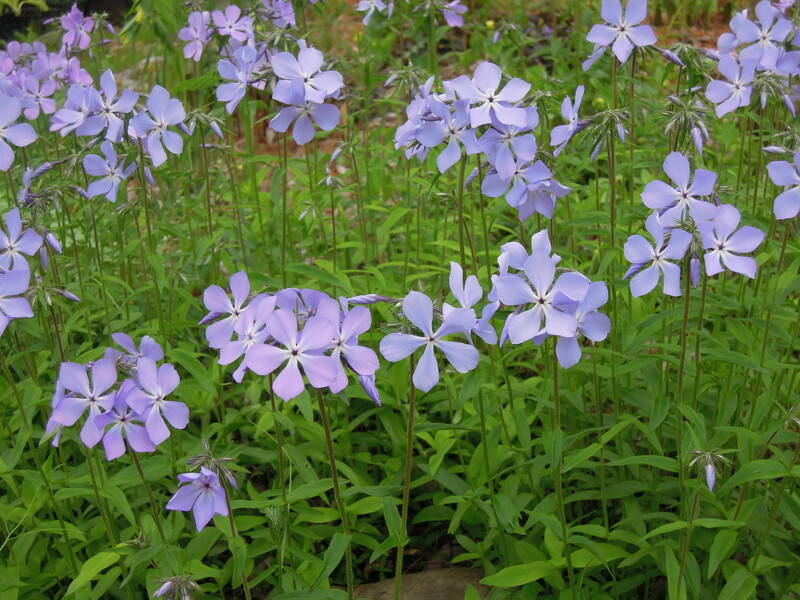 The seeds are discarded by the ants, and then germinate, spreading the plant around the garden or woodland. Seeds of certain species of plants produce elaiosome specifically to attract ants and other insects to encourage seed dispersal. While we enjoy the beauty of our plants, this arrangement is a design we find both intriguing and amazing. Bloodroot gets its name from the color of the sap that flows from the root, should it be broken or scraped. The sap is poisonous and can be a skin irritant to some people. 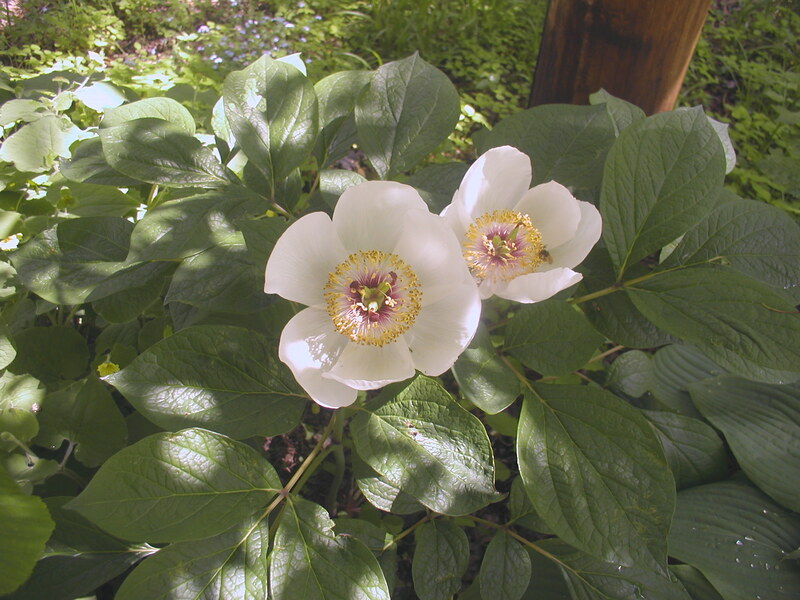 It was used by Native Americans as a red dye and also for some medicinal uses (however, ingestion of the plant is not recommended). Further research will give you a lot of information on both the historical, medicinal, and present uses of bloodroot. 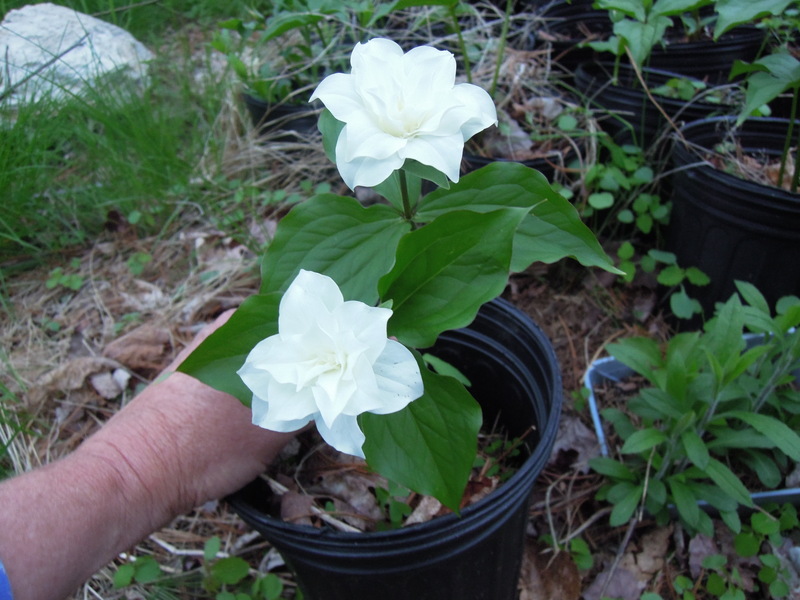 Here at Fernwood we enjoy bloodroots early bloom and sharp white flowers that really stand out when the gardens are just getting going. 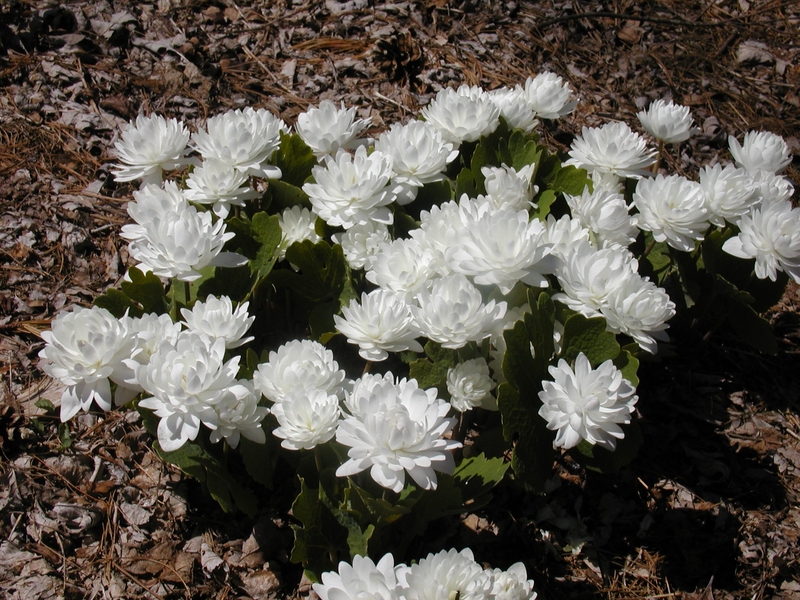 We grow both single and double bloodroot, but only have Sanguinaria canadensis for sale at the moment. Patches of bloodroot are an attractive addition to the woodland landscape and remember to be thankful for those helpful and industrious ants! We were glad to hear the rain last night. Of course, we knew it was coming and spent a bit of the afternoon getting some things into the vegetable gardens that we knew the rain would help. Onions, potatoes, beans, more spinach and greens, the rest of the broccoli and cabbage. Noah, along with his friend Brandon, planted the hoop house with tomatoes, peppers, and eggplant. This morning we woke to continued rain and this allowed us some indoor time. No sense rushing out ( whew!). So what do we do when we’re limited to what we can accomplish outdoors? 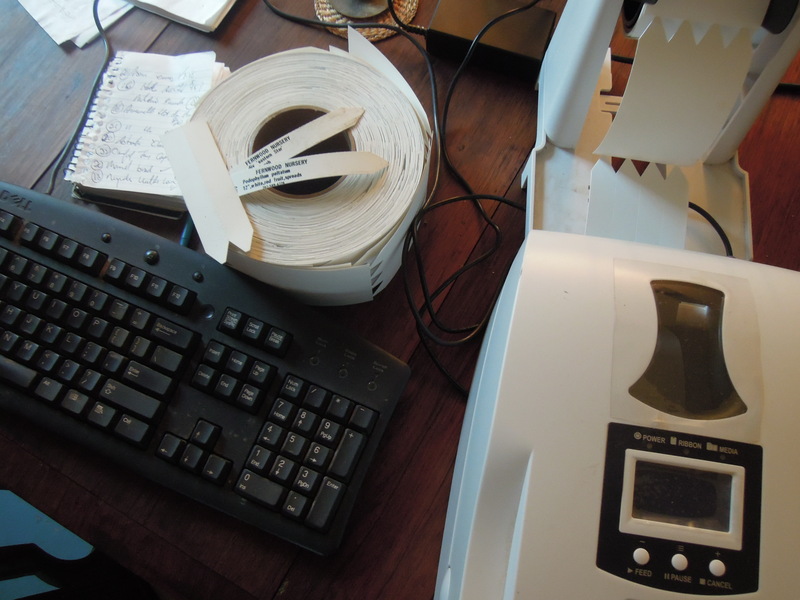 There are always plant labels to print. We catch up on email correspondence. We work in the greenhouse. We make food…….hoping to stock the fridge with good meals for the week, when the rain isn’t blessing the plants with a good watering and us with a break from the action outdoors. Chicken from the freezer is cooked. Fresh greens are brought in. 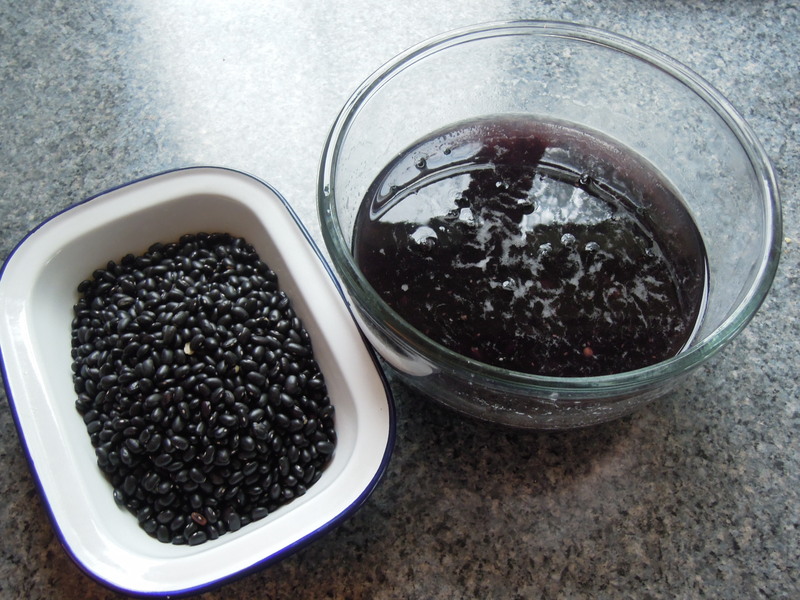 Beans are soaked. The food we grow continuing to sustain us throughout the year. Here we are midway through the month of May. Earlier on, we enjoy the slow procession of the very first plants to bloom, we’ve talked about these….. the hepaticas, corydalis, hellebores, and others that are designed to emerge before the trees leaf out. Now that the soil temperatures ( and night time temperatures, too) are really warming, the gardens are bursting. 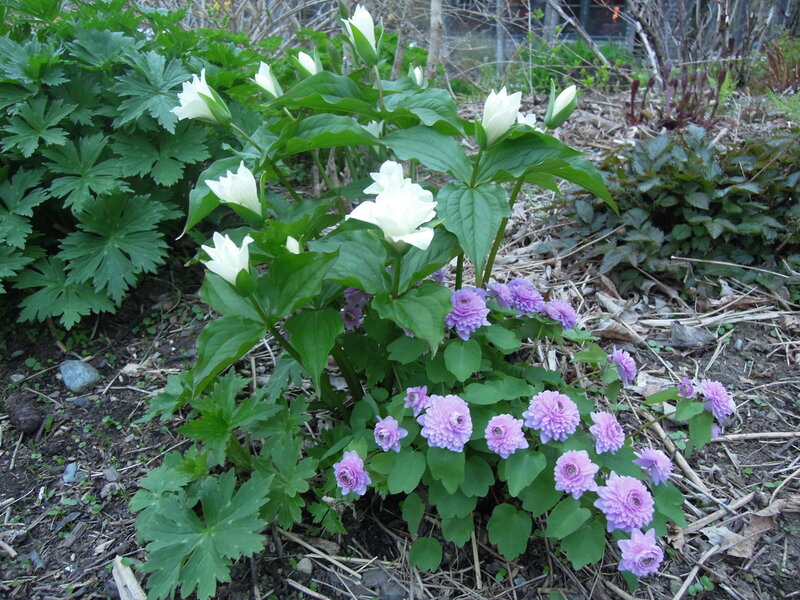 Here are a few examples of what’s growing in the gardens right now at Fernwood. a vessel and stand found at Trash and Treasures, hosta from Fernwood. 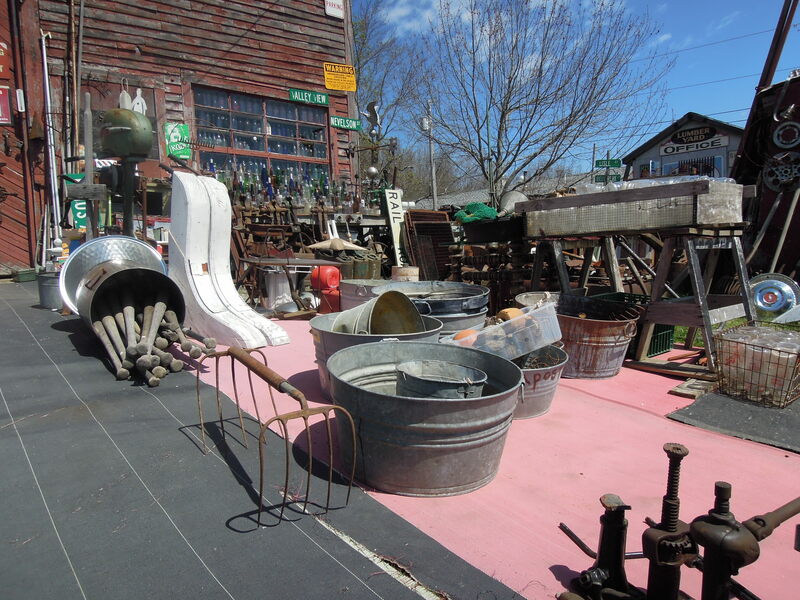 Today we made a trip over to one of our favorite places……Trash and Treasures in Searsport, Maine. We had to do it, the traffic in Maine will soon pick up and all the good trash/ treasure will be fair game to all who travel route one. Mostly, I’m concerned about my friend Sally. I love her like a sister, but goodness knows, she has an eye for anything that has the potential to be upcycled, recycled. or repurposed. When Sally and I go rooting around places that may have old iron, abandoned farm parts, doors, windows, or anything else that has been cast aside, she has what one would call a hounds nose for the good stuff. So, I had to go to Trash and Treasures before she got home for the summer or there would be nothing left. This way I stay one up on her. I’m actually going to send her pictures of the goodies I found today…just to rub it in a bit. 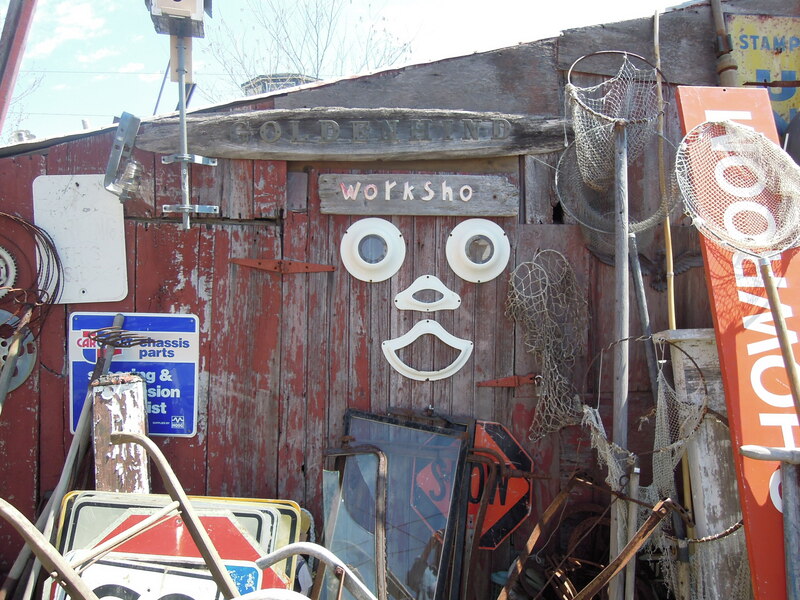 Don’t worry or feel sorry for her, she’ll find her own amazing junk and enough salvage to keep her busy all summer. 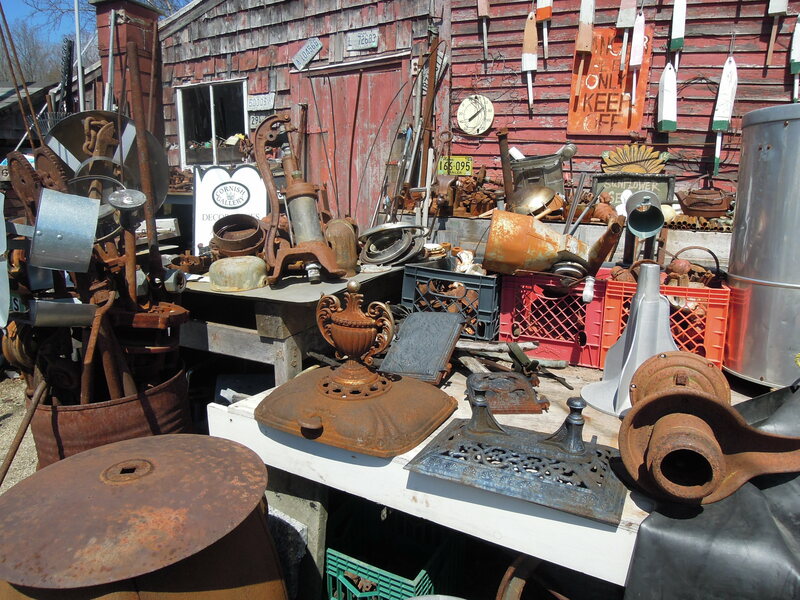 But if your looking for some cool vessels to plant some of your hostas in or a weathered pot for some hardy succulents…….check out Trash and Treasures in Searsport, Maine. Jeff, the owner, is a great guy and keeps his place well stocked with ” treasures”. 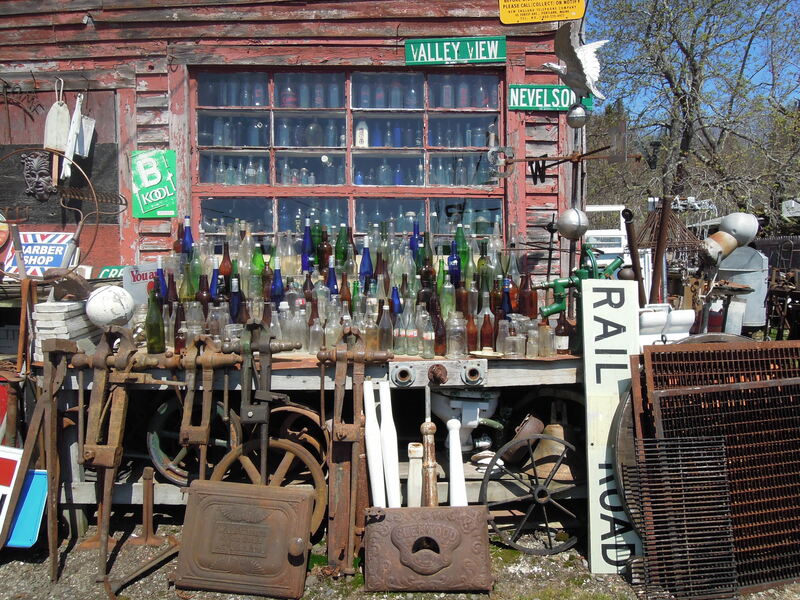 You can easily spend a couple of hours rummaging through the big barn where old wooden boxes, tools, tables, and every kind of building remnant can be found. 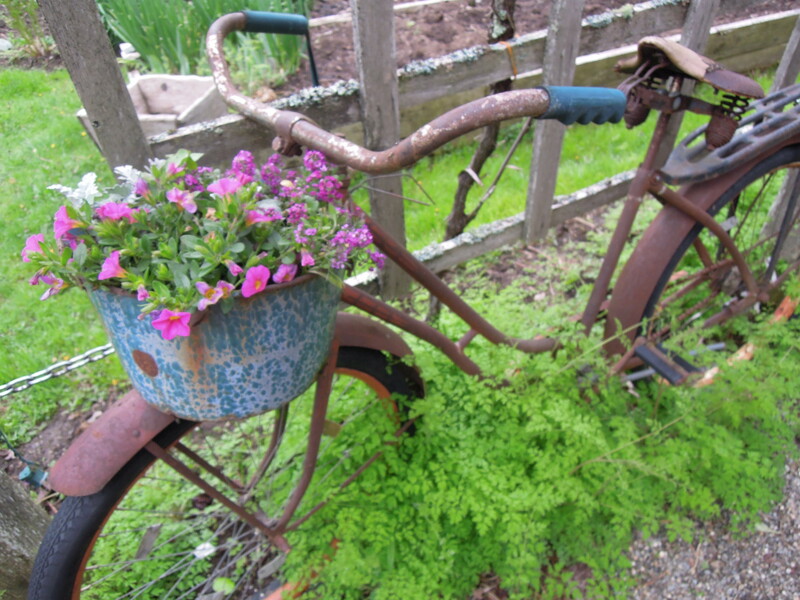 Here at Fernwood, we can always find a plant that looks great growing in an old…..”something” that we found at Trash and Treasures. Right now, we are stocked with a great selection of mini hostas, all of which work very well in containers. Sally will be home soon, I better go back tomorrow and dig for more stuff. 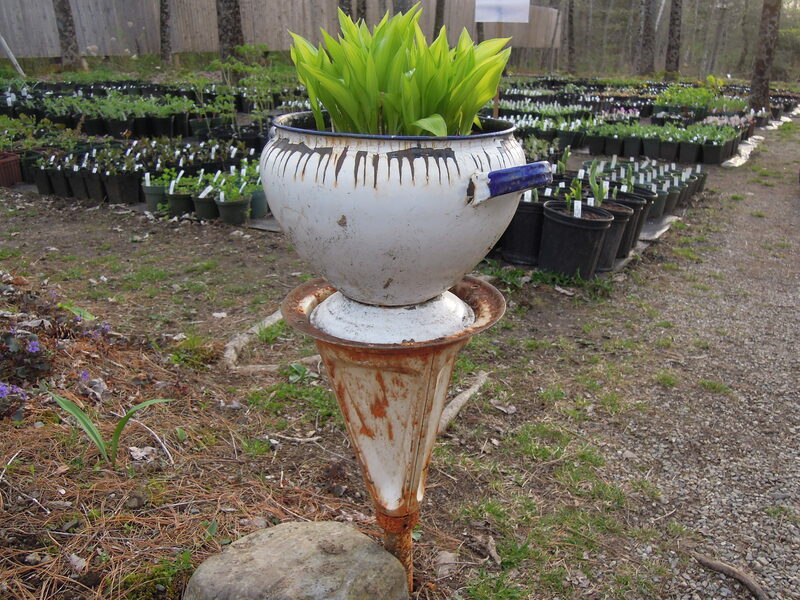 If you’re in the area, go visit Trash and Treasures, you’re sure to find something to put a favorite hosta into! Species peony is a term used for those forms of peonies that are found in nature, the original representatives of their type, unaltered by human hybridization. There are at least 61 recognized wild species and subspecies. As interest and study continues, this number will surely change. Many (or most) of the wild species are endangered or threatened in their native range due to over collecting or habitat loss. It is important to buy only propagated plants, and since it takes about 4 -8 years to grow them to a saleable size, they can be pricey. The species we choose to grow are those that are more shade tolerant. 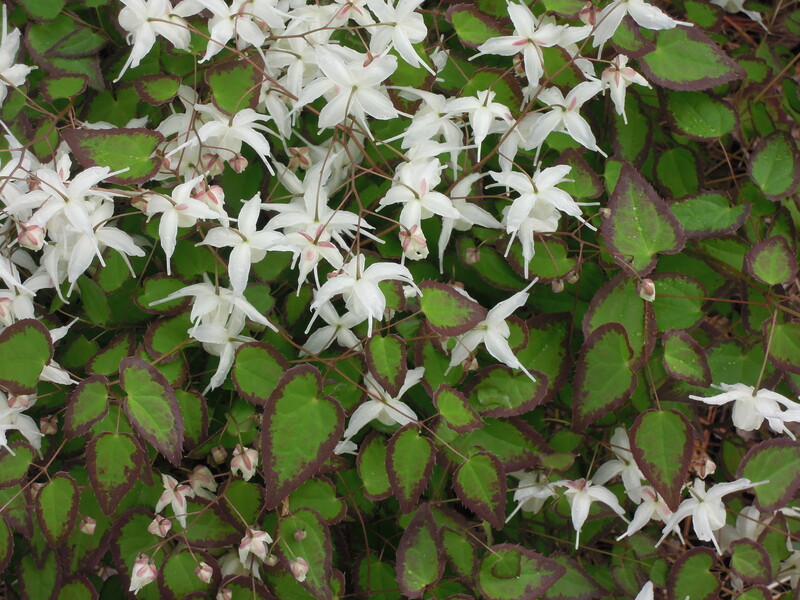 (P. japonica, P. obovata, P. veitchii , P. banatica) This fits in well with the overall focus of the nursery and makes them excellent companion plants with the other plants we grow. Right now they are well on their way to setting flower buds over very attractive foliage of coral, red, and deep green. Emerging very early with the spring ephemerals really adds a lot to the landscape, both in color and texture. We’ve never had a problem with them and late frosts. They seem to take them in stride. They are relatively easy to grow. A woodland setting of well drained soil in light to dappled shade seems to work very well. Avoid wet areas. No staking is needed , as with the hybrids, and there are no significant pest problems. The foliage stays healthy looking all season. In September the seed pods open to a beautiful combination of blue-black seeds set in bright red pods. A real bonus for any garden. We do not provide any special protection for the winter months. 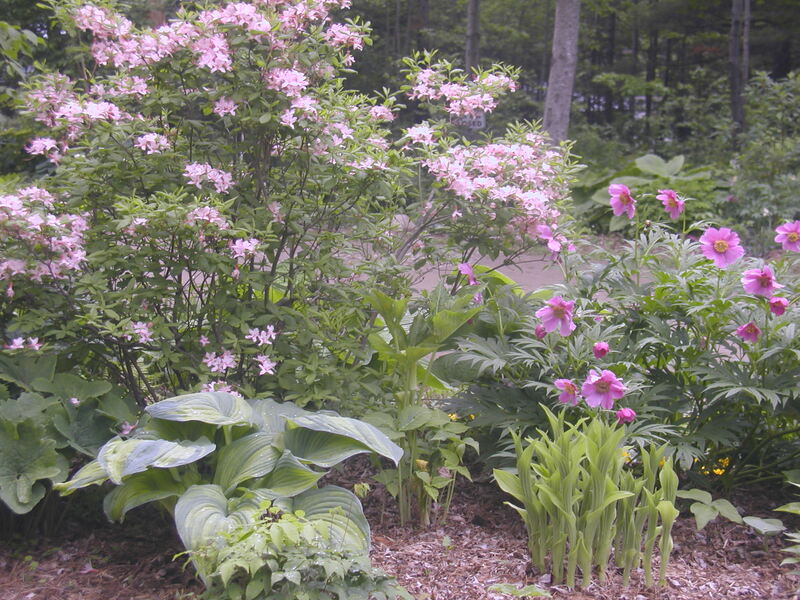 If you grow the hybrid peonies and the tree peonies, the species peonies will extend the season for you. 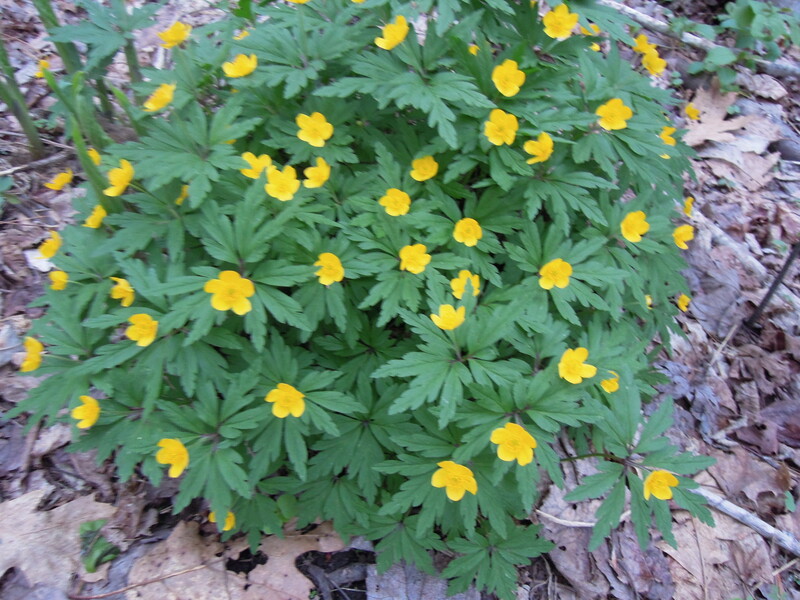 We really enjoy their color and form growing amongst the other woodland plants. 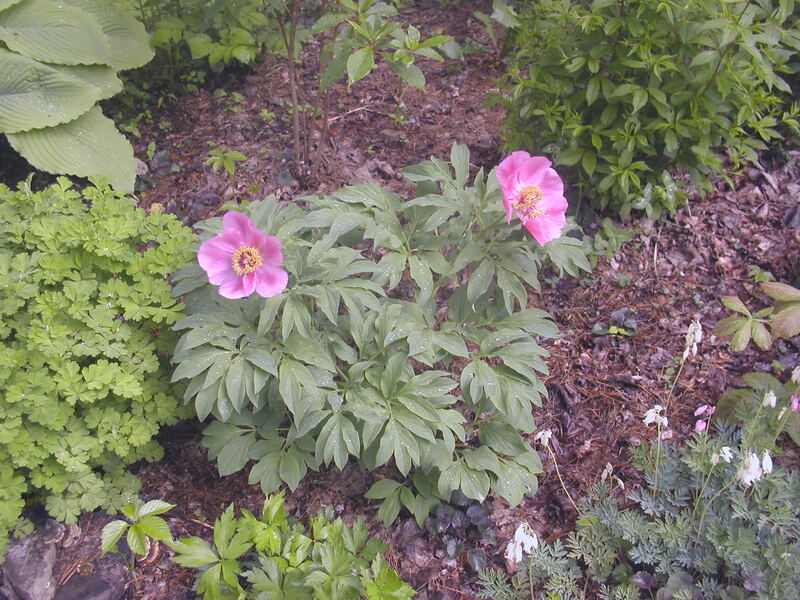 Visitors to Fernwood can expect to see many of these ( and other) wonderful peonies growing in the display gardens. Come check them out! There is a lot to be said for the kind of spring that evolves slowly. Why rush into things? 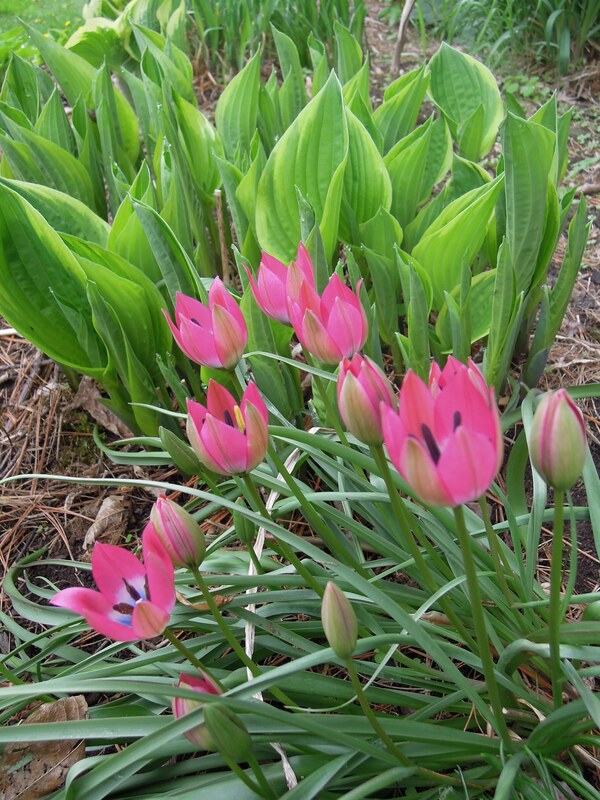 All the early blooming plants are allowed center stage this time of year, no worry about competing with the large leaved hostas or the really dramatic flowering plants. 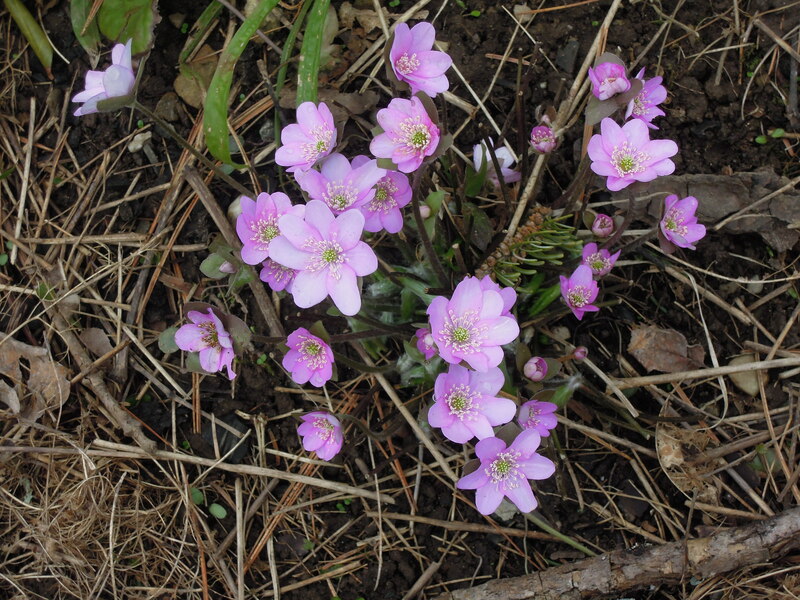 Now is the time to be a simple and beautful Hepatica nobilis. You wouldn’t believe how many times we stop to admire this little gem. Though the lingering cold temperatures are holding back the growth of many plants …..they are all beginning to make their appearance. 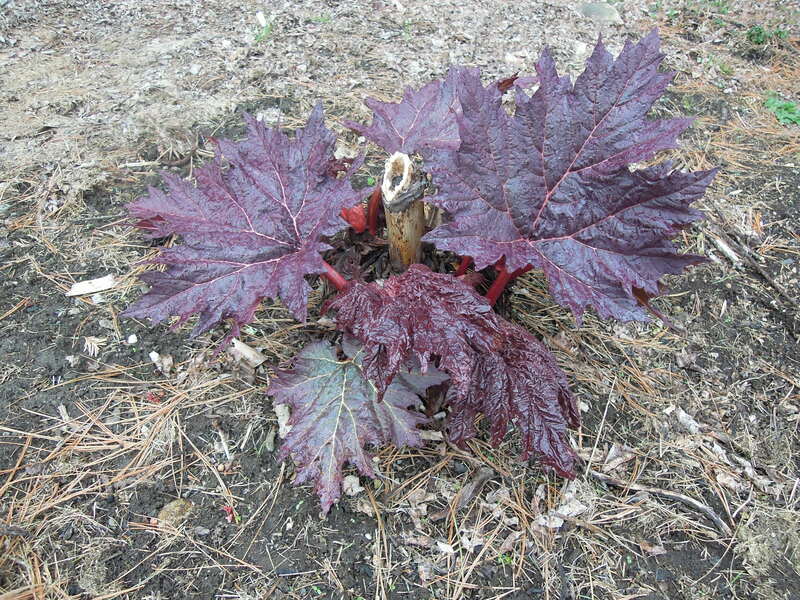 We love this ornamental rhubarb, Rheum palmatum ‘Red Herald’. In the spring it has very red/purple cut leaves that really stand out in the early spring garden. By summer, the tops of the leaves are green, but the undersides remain a very deep red. 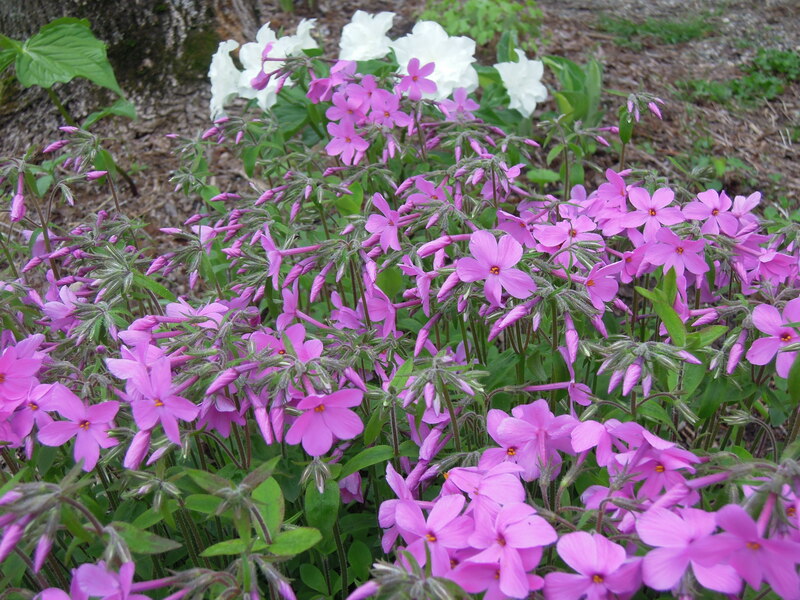 It has tall spikes of pink flowers, and reaches an average size of 3’x5’wide. Our customers are always struck by its size and color. 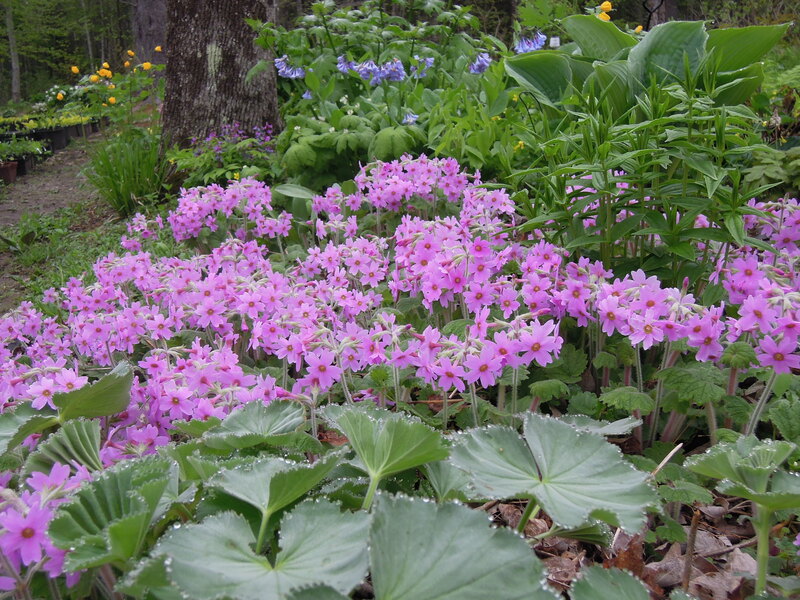 It really makes a statement……but no more than our beloved Hepaticas.